On Monday and Tuesday, 25 and 26 March 2019, Israeli forces carried out dozens of airstrikes on various targets across the Gaza Strip. These airstrikes have been the most violent in recent months that have not spared civilians and displaced dozens of them after 10 days of a similar aggression. For 12 hours, two million Palestinians in the Gaza Strip lived in a state of terror and fear due to the continuous Israeli airstrikes that targeted various locations; some were in densely-populated areas throughout the Gaza Strip. According to the documentation by PCHR’s fieldworkers, the Israeli warplanes launched 66 missiles at 34 targets across the Gaza Strip, including residential buildings and civil facilities, under the pretext of having security service offices underneath or near them. As a result, 2 Palestinian civilians were wounded due to the scattering glass and bricks following those airstrikes. During and after the airstrikes, dozens of civilians were forced to evacuate from their houses dreadfully in the cold weather at night, rendering 13 families comprised of 70 members, including 44 children and 14 women, homeless. – Targeting al-Multazem Insurance Company located in the ground floor of al-Ghazali Building. Al-Ghazali was comprised of 2 buildings on an area of 662 square meters and included 10 residential apartments next to the Municipality Park in Gaza City. The Israeli drones and warplanes targeted the building with 5 missiles after the Israeli Intelligence called the building’s owner and ordered him to evacuate. As a result, the nearby buildings sustained severe damage, and families of 29 members, including 19 children and women, were displaced. – Targeting Hassounah 4-storey building, which include 8 residential apartments and whose warehouses were rented by the Internal Security Service, in western Gaza City. The Israeli warplanes targeted the building with 8 consecutive missiles after calling the residents and ordering them to evacuate. As a result, the building was completely destroyed, and nearby buildings sustained severe damage. Moreover, 9 families of 41 members, including 25 children and 9 women, were displaced. – Targeting the office of Head of Hamas political bureau, Ismail Haniyah, in al-Naser neighborhood in Gaza City and completely destroying it with 4 missiles in addition to causing extensive damage to the nearby houses and facilities, including the Palestinian Association for Development and Reconstruction (PADR). – Targeting the Khan Younis Seaport and so destroying 2 boats belonging to the Marine Police and causing severe damage to 6 fishing boats and nets. The rest of the targets varied between agricultural lands and sites belonging to the military wings of the Palestinian factions, causing damage to the nearby residential buildings. In addition to the destruction caused by the airstrikes against the targeted locations and the damage caused to nearby houses and facilities, the resulting explosions caused panic and fear among civilians, especially women and children, as the explosions reminded them of the traumatic experiences they lived in the three offensives of 2008-2009, 2012, and 2014. With this wide-scale tide of escalation, Palestinian civilians in the Gaza Strip found themselves again under disproportionate airstrikes, which fall under the Israeli collective punishment policy, after Israel had declared that two rockets were fired from the Gaza Strip over northern Tel Aviv, wounding 7 Israelis. PCHR emphasizes that the continued Israeli attacks on populated residential areas and the use of weapons on the basis of collective reprisals constitute grave violations of the 1949 four Geneva Conventions, amounting to war crimes. 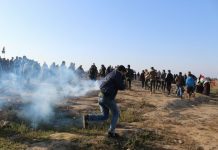 PCHR warns that the military escalation by the Israeli forces and the deterioration of the calm situation would exacerbate the difficult humanitarian conditions in the Gaza Strip, with the continued impact of the three devastating offensives and tightening closure for 13 years. PCHR calls upon the international community to immediately intervene to stop Israel’s crimes and reiterates its call upon the High Contracting Parties to the 1949 Fourth Geneva Convention to fulfill their obligations under Article 1; i.e., to respect and ensure respect for the Convention in all circumstances and their obligations under Article 146 to prosecute persons alleged to commit grave breaches of the Fourth Geneva Convention. These grave breaches constitute war crimes under Article 147 of the same Convention and Protocol (I) Additional to the Geneva Conventions regarding the guarantee of Palestinian civilians’ right to protection in the oPt.